The Clean Water Act and the North American Native Fishes Association were both started in 1972! 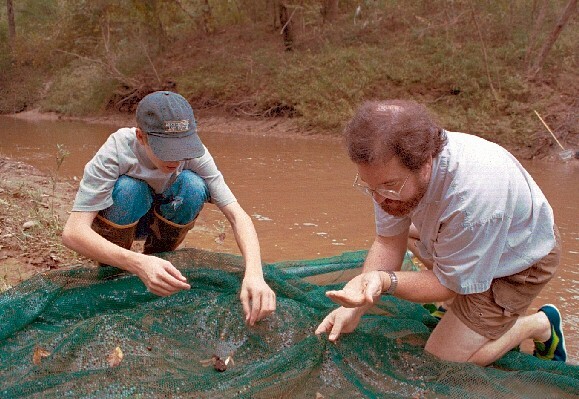 Friday 18 Oct 2002 was National Water Monitoring Day, in which volunteers across the United States tested local waters (especially those not regularly monitored by state and federal agencies) so that areas of degraded water quality can be identified and delineated on a national scale. We urge all interested members of NANFA to read about and participate in this worthwhile effort: www.yearofcleanwater.org/events/volunteer.htm This could also be a great excuse to organize a field trip, collect some fish, and, possibly, begin our own tradition of annual fish-habitat surveys. Test kits cost $16.50 and are available through the Year of Clean Water website. These kits allow volunteers to test dissolved oxygen, pH, water clarity (i.e., Secchi transparency), and temperature up to 50 times. The kits are easy to use and recommended for ages "8 and up." The NANFA BOD has indicated that it may be able to help defray cost of test kits for reps/members that choose to participate. Use of this particular test kit, however, is not required. You can use other test kits or water quality probes. Sampling sites are registered online, and it is easy. You just click on the map of the US until you find your water body, enter the latitude and longitude (it changes as you click on the map), and then provide some background information (where you will sample, name of stream, etc.). It only takes a few minutes. 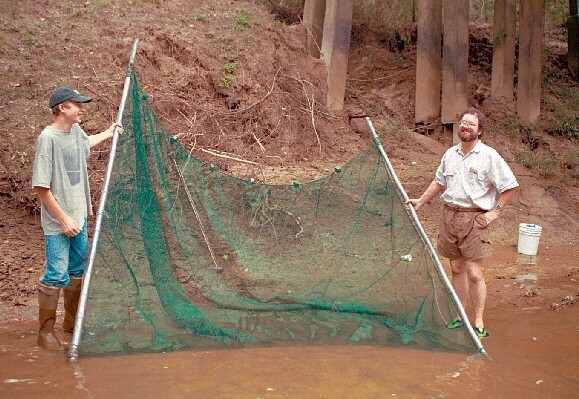 Despite raging rivers and gloomy skies, NANFA members Martin Moore (right), Tyler Strange (left), and Jan Hoover (not pictured) met Sunday afternoon, 13 Oct 2002, at Utica, Mississippi to sample habitat and fishes as part of National Water Monitoring Day. 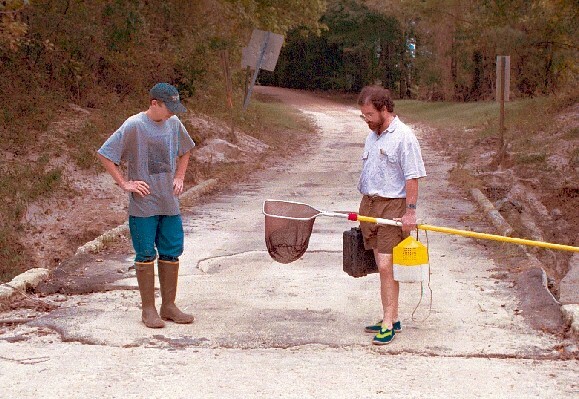 Equipped with various meters, wading rods, dipnets, and seines, they visited three locations in the upland streams of the White Oak system (Bayou Pierre Drainage). 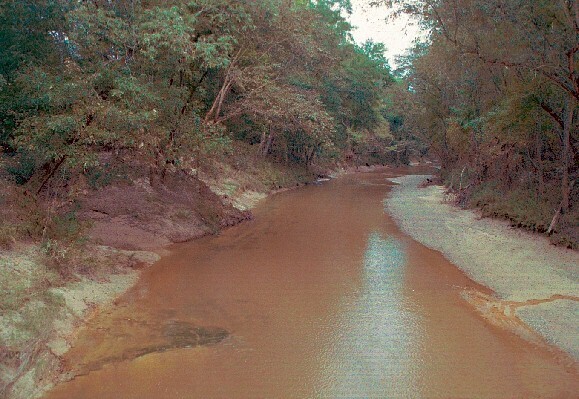 The first locality was lower White Oak Creek at Highway 18. Erosion was evident by the steep, high banks, and the stream bottom was silty and unconsolidated. Fish were not sampled but water quality was recorded. A Hydrolab multi-parameter water quality probe was used to measure water temperature, pH, and dissolved oxygen. Tyler watched the display continuously to see when dissolved oxygen readings stabilized. 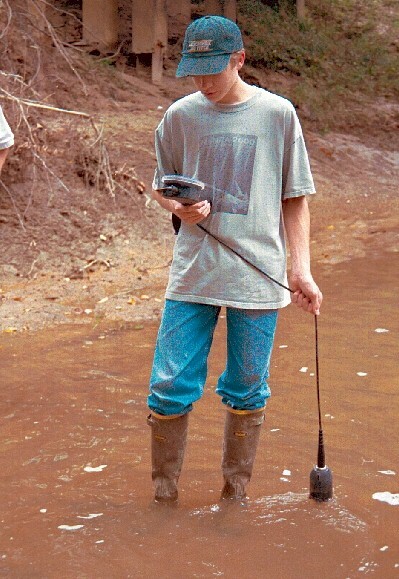 A Hach 2100P turbidimeter was used to measure turbidity, or opaqueness of the water. Tallahalla Creek at Highway 27, the second locality, was more inviting to fish enthusiasts. Banks were stable and substrates were a mix of firm mud, sand, and gravel. The introduced Asian clam, Corbicula, was abundant in patches. Fishes were collected principally be seining. The seine used was 8 X 10 ft, 3/16 inch mesh, which is small enough for kicksets in shallow water, high enough for sweeping deep pools, and coarse enough to let recently spawned (and mostly unidentifiable) young-of-year pass through. compiled, though, with notes on relative abundance. Common species here were longnose shiner (Hybopsis longirostris), bluntface shiner (Cyprinella camura), and blacktail shiner (C. venusta). Uncommon but notable was the silverjaw minnow (Erycimba buccata). 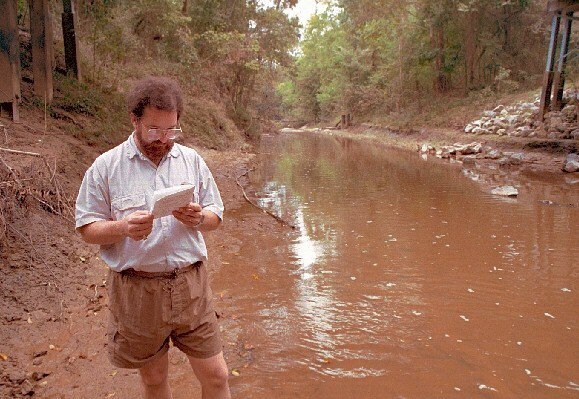 The third locality, upper White Oak Creek at Low Water Bridge Road, has been sampled by Jan and his co-workers at Waterways Experiment Station annually since 1994. Martin reviewed the species lists compiled for recent years and wondered at the apparent lack of sand darters (Ammocrypta spp.). 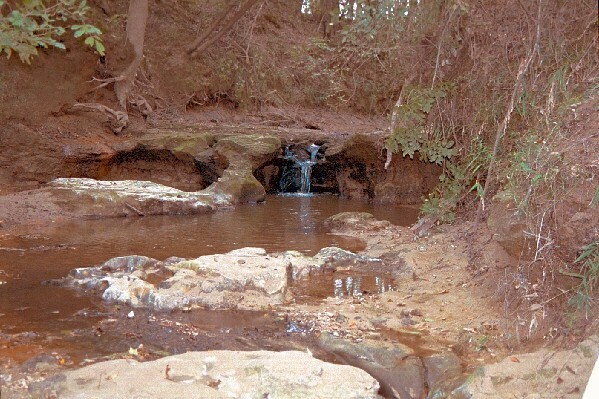 A tiny tributary consisting of deep pools, waterfalls, and narrow runs, emptied into the stream. 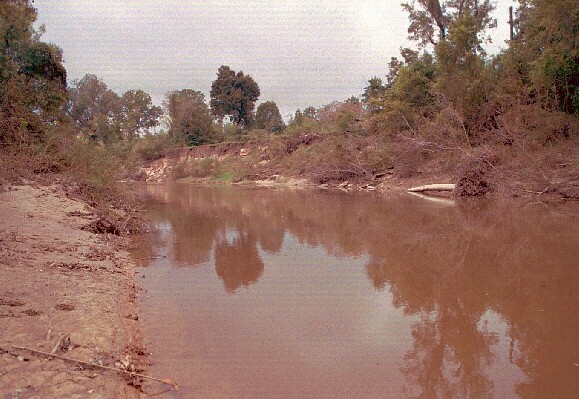 This tributary was inhabited by southern striped shiner ( Luxilus chrysocephalus), sunfishes (Lepomis spp. ), central stoneroller (Campostoma anomalum), and a chubsucker (Erimyzon sp.). 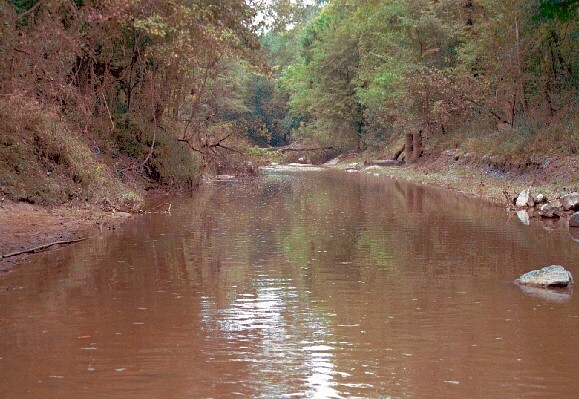 The main channel was shallow, and consisted of riffles, runs, glides, pools, and undercut banks. Unusual were specimens of the least madtom (Noturus hildebrandi) comparable in abundance to the brindled madtom (N. miurus). The most notable find of the day, however, was the bayou darter (Etheostoma rubrum) collected at Tallahalla and White Oak Creeks. This species is endemic to the drainage, and is listed as an endangered species, although some observations indicate that it is expanding its range. These specimens, collected at dusk, were a little ambiguous. 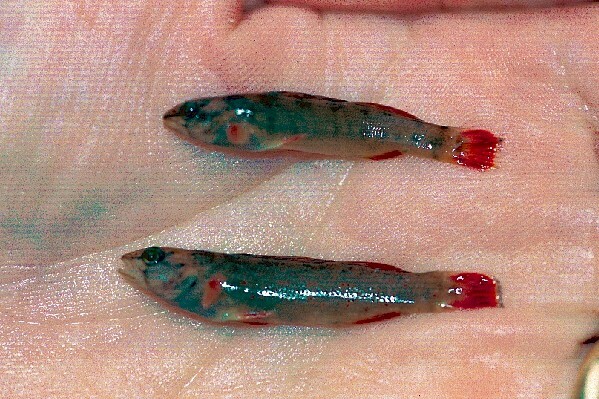 They lacked the white cheek and very distinct teardrop and paired caudal spots characteristic of the bayou darter, but showed caudal "smudges," a creamy band at the base of the caudal fin, and intense red pigmentation. Todd Slack and Scott Peyton, at the Mississippi Museum of Natural Science, examined this photo and confirmed that these were bayou darters.